If there’s one thing we’re crazy about in our family, it’s cats. But my kids and I LOVE our cat, who’s sweet, soft and in his twilight years (he’s 17). Ha! Yes, I like this phrase, too. Good luck being on time just. one. more. week. You can do it! thedoseofreality recently posted…Would You Rather: Plan It All Or Be Surprised? Ooo, another cat for the Dose Girls! There has to be good material coming out of that! We are total cat lovers over here! 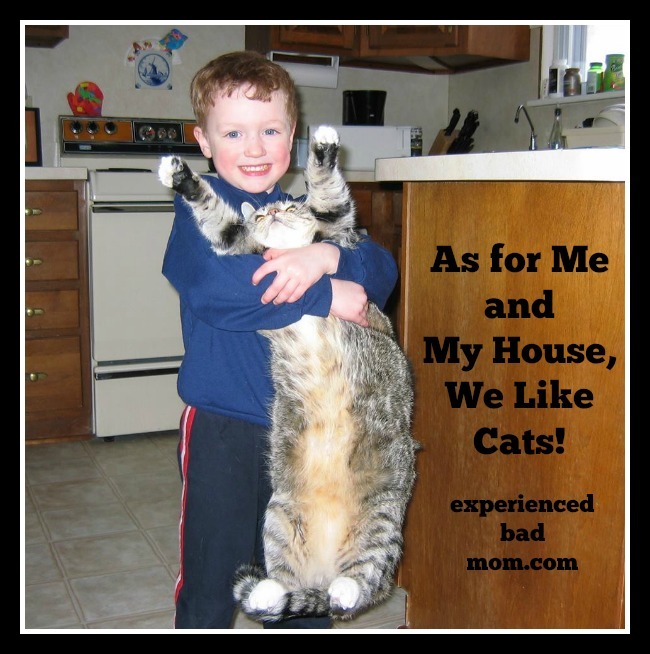 My one cat is HUGE and my toddler rides him like a horse. No joke! MUST. SEE. PICTURE!!! Seriously, I’d love to see that! Put it on Instagram and tag #catsofinstagram. It’ll get all the kitties of the world to <3 your pic. Holy Jumpin’ Catfish! That video of the dog attacking the bike is quite something! Did you notice too that “mom” ran inside before her little one? Wow. What a great cat. AND I have to say I love your family pics and the accompanying comments. You are the only non relative I’ve heard say “bejeesus!” Great word, no? As for pets – have never had a cat so I have to get my hugs of them through those of family and friends. Currently we have a rabbit who lives mostly inside and a dog who thinks she’s human. May your princess pyjamas cat live many, many more healthy years! Thank you for the well wishes for kitty’s longevity! I really hope I don’t have to go all Pet Semetary on him some day and artificially keep him alive. He and my son share a really special bond. So happy to have bonded over “Bejeesus”! SO cute!!!! 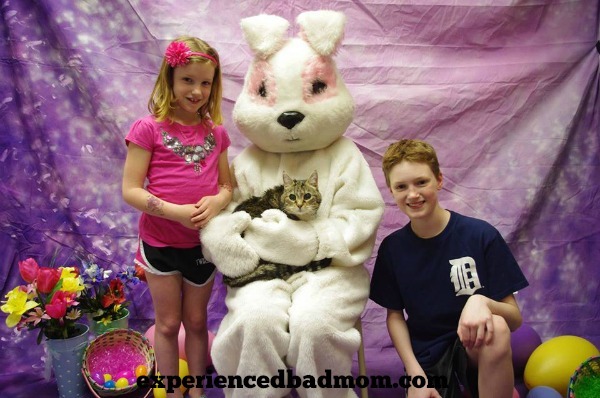 I can’t believe you took your cat to see the Easter bunny!!! Now THAT would have been hilarious if I was say, some random person in line behind you! LOVE that cat who kicked that dog’s ARS and saved the little cutie! I saw that on the news- amazing!! Loved your pics too. TOO fun! Thanks for dropping by and commenting, Seana! I love that kitty hug video, too. So sweet and funny. The more cats the merrier. Especially the mellow ones that let you dress them up and stick them in the stroller. Hello from Turn It Up Tuesday. Hello back! Thanks for coming by. Love the kitties that can handle the stroller! This is funny! I have to admit, I enjoy some great cat videos and memes! Echo recently posted…Almost Wordless Wednesday! There are some AWESOME cat videos and memes out there! Thanks for commenting. That cat that chased off the dog rocks! We love our cats too. We have 4 of them. They all have such different personalities. We love our dogs too. If I had to choose, I’d say I’m a dog person, but I’m really both. I can’t go to sleep at night if Oreo isn’t with me. Her purr is soothing. I love seeing your cats on Instagram, Michelle! I’ll have to keep my eyes peeled for more pics of the family dogs. Your cat sounds absolutely wonderful! I adore Cats, have 4 indoor & have 9 TNR cats (no longer feral- have tamed them except for one!). Of course I also have dogs, Koi & a parrot~ one big happy family.